Specificity in the associations between saprotrophic basidiomycetes and bacteria may have developed in all the interaction types described. This could be the result of the strong selective environment that is created by lignocellulose-degrading basidiomycetes. Bacteria surviving under these conditions may either be competitors, mutualists or predators. However, so far, information on specificity of associations between saprotrophic basidiomycetes and bacteria is very limited. Seigle-Murandi et al. 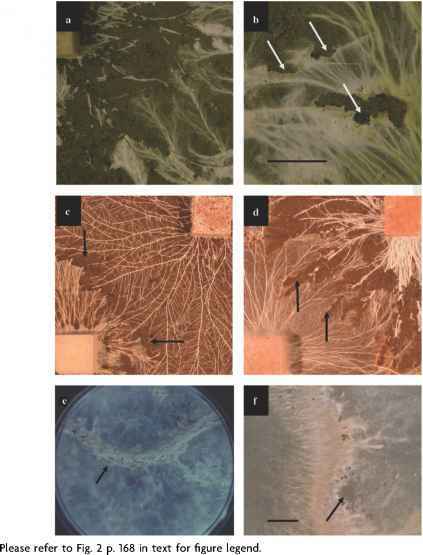 (1996) reported the specific association of three different bacterial strains with hyphae of the white-rot fungus Phanerochaete chrysosporium, but this could not be confirmed by others (Janse et al., 1997). We observed species-specific effects of the white-rot fungi H. fasciculare and R. bicolor on the bacterial community composition in decaying beech wood blocks, both at the level of bacterial genera and within a bacterial genus (Burkholderia) (Folman, Boddy and de Boer, unpublished results). Since both fungi acidify the wood environment and produce lignolytic enzymes (reactive oxygen species), it was to be expected that the specificity was due to differences in secondary metabolite (antibiotics) production. The surface of fruit bodies of basidiomycetes has been the source for new bacterial species, but it is not known whether the occurrence of these bacteria is really restricted to these fungal environments (Tsukamoto et al., 2001; Lim et al., 2003).